Ronan Lyons, Daft's in-house economist, commenting on the latest Daft research on the Irish property market. Most analysis of the housing market - both sales and rental - is currently done through the lens of the last housing bubble and where it was when it burst in 2007. However, that is a point of view that is increasingly out of date. 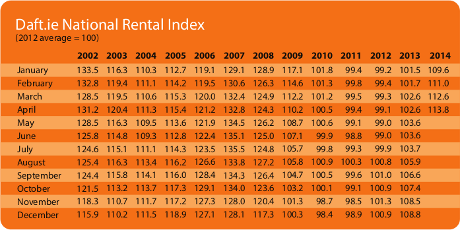 In the rental market, for example, rents bottomed out in Dublin and Cork cities in late 2010 and had actually bottomed out a year earlier in Galway city. Ireland's urban centres are four years into a new housing market cycle - and yet there is still very little evidence that anything is being done about what is now a chronic shortage of accommodation in Irish cities. 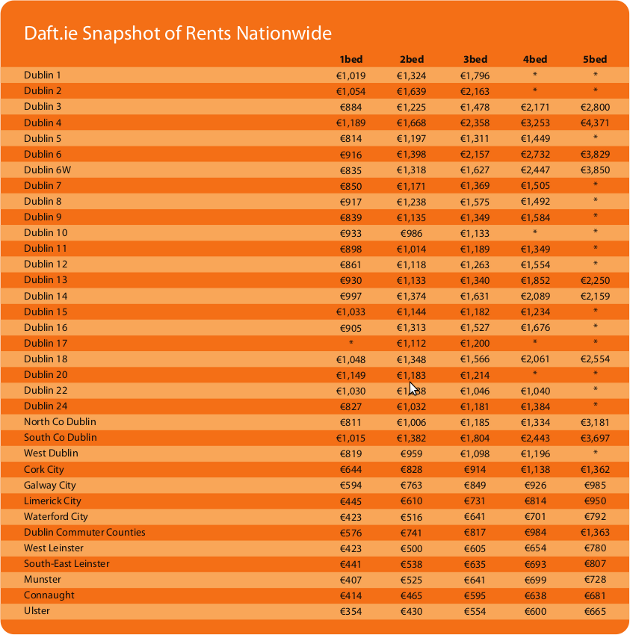 With local and European elections just a couple of weeks away, a number of candidates - particularly in the Dublin constituency - have been talking about rent control as a necessary remedy for the ills of rising rents. However, while the desire to simply make illegal what you don't like is understandable, it mistakes the symptom for the underlying disease. On the one hand, tenants already have reasonable security of tenure. Since the Residential Tenancies Act 2004, once a 6-month probationary period has been passed, tenants have security of tenure in four-year cycles, something that is known as a "Part 4 Tenancy". (To ensure this is the case, tenants who have signed one-year leases need to notify their landlord about their intention to stay - more here.) There are a certain number of conditions under which a landlord can terminate a tenancy, but getting higher-paying tenants is not one of these. On the other hand, rising rents are caused by a lack of accommodation in urban centres and reducing rents will discourage the provision of new accommodation, thereby making the problem worse. 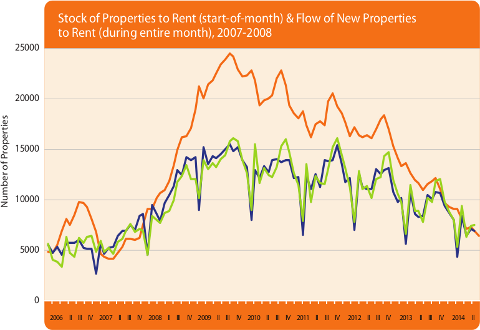 What we have seen in both sales and rental markets is reasonably robust demand for accommodation in Dublin and other cities, which has pushed up both rents and prices. These should be acting as a signal to bring about new supply - so why has significant new building not started in Ireland's cities? Whether construction of new homes takes place depends on whether revenues exceed costs. Revenues come from rents and house prices, which both appear to be at the cusp of affordability given incomes in Ireland. Therefore, if rents and prices are high enough, the solution is about reducing costs in construction - not about capping rents and thus further discouraging the very construction that would alleviate the accommodation crisis. The cost base in construction includes capital, labour, land and regulation, as well as materials, whose prices are typically set on world markets. What is needed now is for the Government to go through each element in the cost base and develop actions to lower costs. It may surprise some readers to learn that the cost of building a house is 3.3% higher now than in 2007. Labour costs in construction fell once, in March 2011, when hourly rates were reduced by 7.5%. But in an economy where the average disposable income fell by 25% between 2006 and 2012, and where there are significant numbers of long-term unemployed construction workers, is that enough? More importantly, the minimum hourly rate for a basic operative in Ireland at €13.77 remains a quarter higher than in West Germany (€11.05, a figure which will rise to €11.30 by 2017). Department of Environment figures indicate that for every €1 of materials, €2 is paid in wages, so the wage rate in construction has a real effect on levels of construction. Just as important is the cost and supply of land. If people are allowed to hoard land or sit on derelict or vacant sites, this imposes a cost on the rest of society. Dublin City Council's proposed levy on derelict and vacant sites may help encourage unused land to be used, but it can do nothing to encourage land to be used better and its biggest effect may be just a clamour to have some activity - any activity - on these sites to avoid tax. Related to this, various levels of government currently deploy a bewildering array of planning and building regulations and charges, each of which increases the cost of building. While standards of quality should not be sacrificed for political expediency, many of the regulations - such as minimum sizes - appear have to very little connection to quality and instead look like the preferences of planners and policymakers trumping those of households. How the system currently treats land and planning regulations needs, at the very least, to be streamlined. Overhauling a dated and complicated system of stamp duties, development levies, commercial and industrial rates and amenity contributions, not to mention the Local Property Tax, with a single unified Site Value Tax is clearly the best solution to join up the very disjointed Government system that underpins Ireland's construction sector. The Government's new strategy for the construction sector will be published shortly. No doubt the headline measures will relate to capital, with a fund for construction projects or targets for the pillar banks featuring prominently. But capital is only one part of the puzzle. Labour, land and regulation are just as important. It is to be hoped that the new strategy will contain specific measures to lower the cost of both labour and land, as well as streamline the Byzantine system of planning and building regulations. Only a holistic approach will be good enough if Ireland's latest housing crisis is to be stopped.